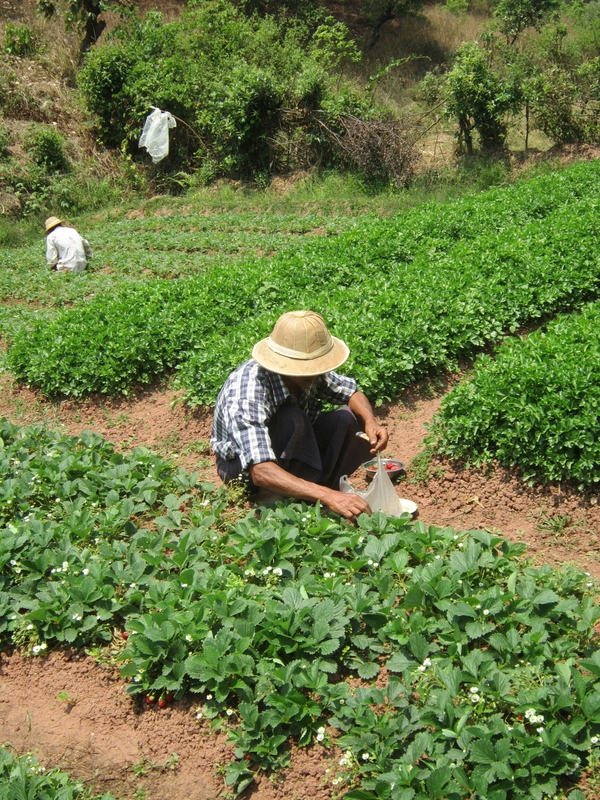 The main reason for travellers to visit Kalaw is to do the trek from there to Inle lake. 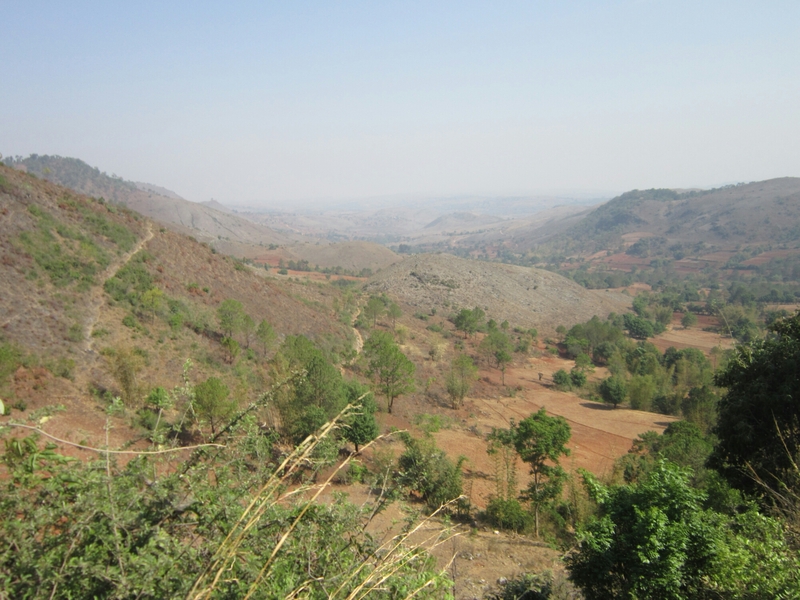 After arriving in Kalaw, 10 of us who had hired the bus to bring us here elected to trek together. 7 of us had already made plans for this in Bagan, and we were joined by 3 Austrians. The other 6 were 2 Norwegians (1 mum, 1 daughter), then all travelling separately 2 English girls, 1 Dutch guy and 1 Portuguese guy. A good group! We stayed at Golden Lily guesthouse as i’d had the trekking from there highly recommended to me and others had heard good things about it too. One of the great things about the travel grapevine, you get some great advice! The guesthouse itself is ok, basic but fine. 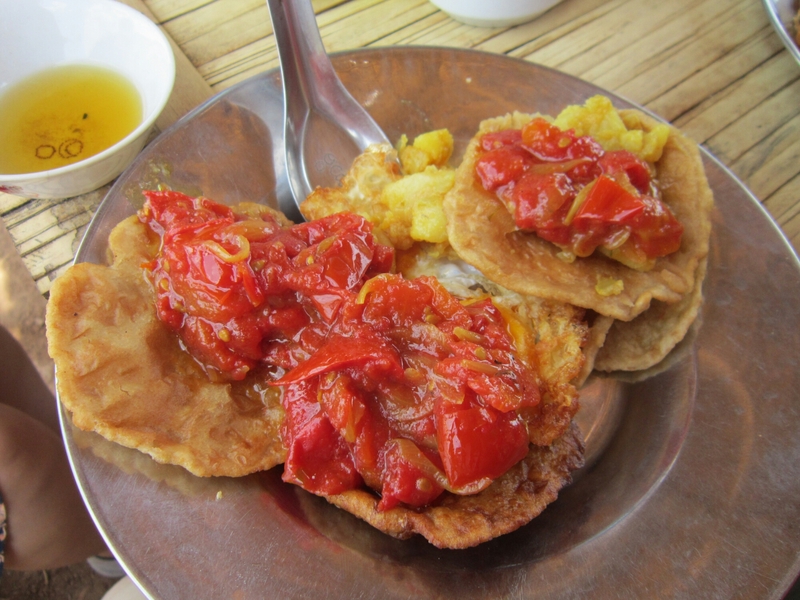 It is run by an Indian family who were brought to Kalaw by the British in the colonial times. We met our guide Mr Robin (brother of Lily) who was very impressive and knowledgeable as he explained about our trek plans. He turned out to be a fantastic guide too! 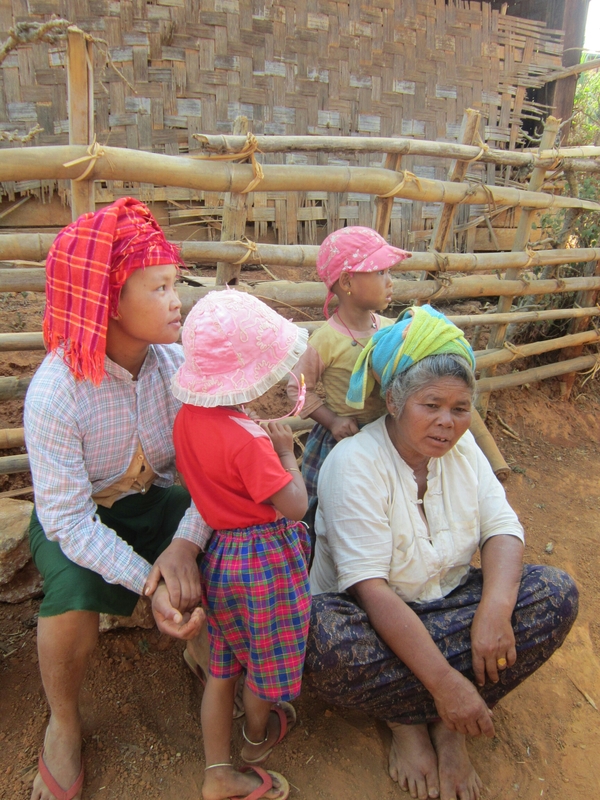 We were do a 3 day trek, 2 nights to be spent sleeping in local villages and then the 3rd day arrive to Inle Lake. So in the evening the 7 of us went for some food at a local place. It was still Thingyan so we saw some locals celebrating early on, but they’d finished later. In the morning we met up with the Austrian’s and when ready set off with Mr Robin! I’ll mention now that unfortunately 1 of the Austrian’s was sick so after the 1st night she and her husband had to stop trekking and go ahead by motor bike, which obviously sucked. The other carried on with us so that was good. Mr Robin was really great at pointing out local plants/fauna and explained when they could be used for medicine or food. He also pointed out a lot of things left from the British colonial days that were still being used, such as water pipes, old houses and so on. 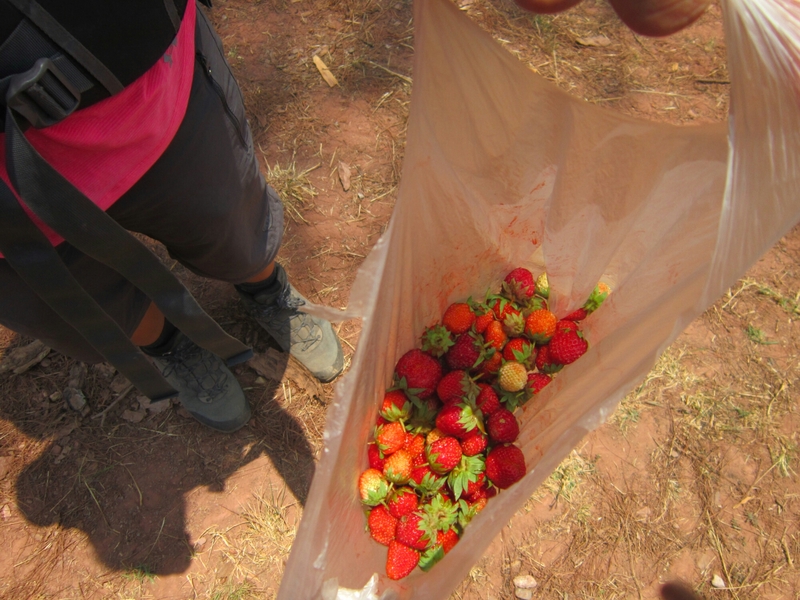 We stopped at a strawberry farm not long after leaving Kalaw and Mr Robin bought us some fresh strawberries which tasted great. Throughout the trek Mr Robin made an effort to keep us from encountering other trekking groups too much, he told us that he was taking us a different route from the standard tourist one so that was cool. We stopped off at a little hut for lunch, there was only one guy there. The food was good, in particular the tomatoes and I really liked the Indian sweets we had as dessert (after some mango!). After lunch we stopped by a small shop. It was the last day of Thingyan and there were some locals celebrating, throwing water over each other and any motorbike or Buddhist pilgrim truck that passed. Me and another of the guys joined in for awhile. We visited another village along the way where the 2 English girls tried Betel nut, which is something many of the Myanmar people chew. You can tell who chews it a lot as it stains there teeth a kind of dark red! Anyhow not for me! We also walked along the train line for awhile, it is another thing from the British colonial days and still works though the train is very slow! We stayed the night in the village of Ywa Pu. Our hosts cooked us a big dinner which was great. They had lots of cute kittens too! The shower was cold water and a bucket. Our group had 1 room which we had bedding spread around. I guess because of it being the last day of Thingyan it was very noisy for awhile as a group of locals went around from house to house playing drums and dancing. Apparently the guy playing this huge drum drank 2 bottles of whisky. Ouch. Anyhow next morning we set off again. 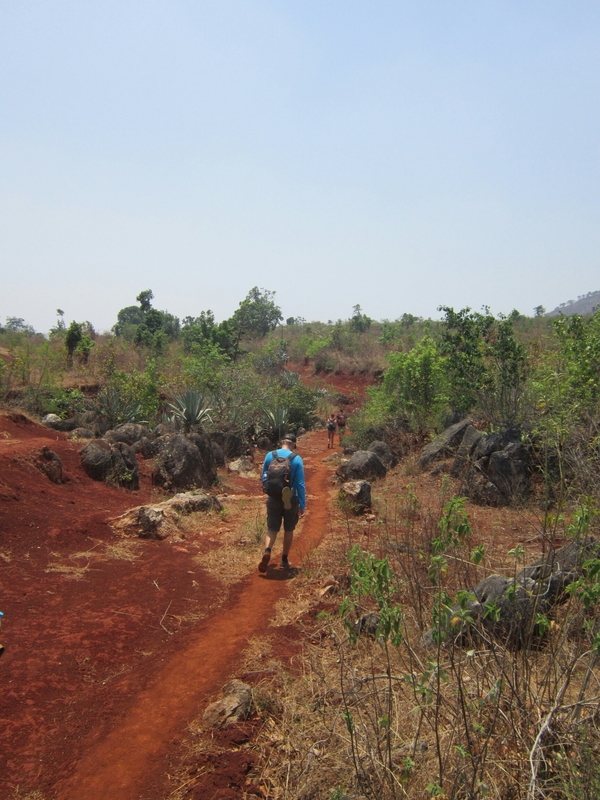 We bumped into a couple other trekking groups and Mr Robin decided we wouldn’t enjoy the next 5km of walking so he got a friend to pick us up in a mini truck and take us to another village and went from there. 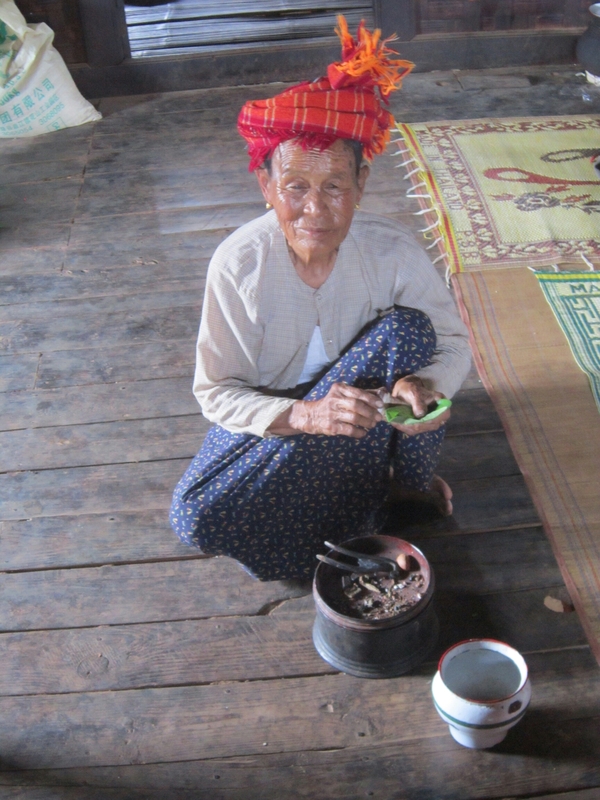 Our next stop was this village where we had tea and snacks with an amazing 82 year old woman, who also prepared Betel nut for anyone who wanted to try. We rested there for awhile as the worst of the days heat passed. Continuing on we passed some interesting landscape including farm terraces. We also stopped at a stream for awhile where we saw one of the other trekking groups again. They were not having the best of time with their guide sadly. 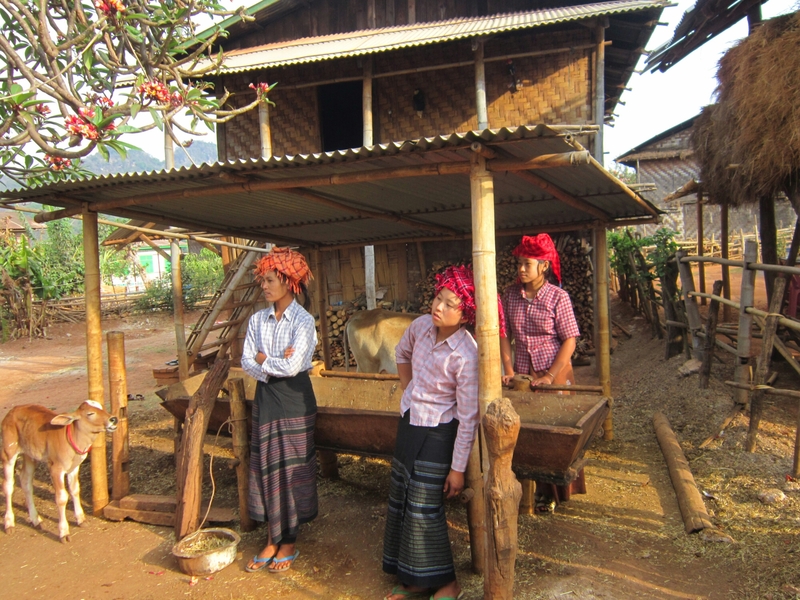 We also passed many local Myanmar people, be they farmers or pilgrims. Sometimes Mr Robin asked them questions and translated for us. 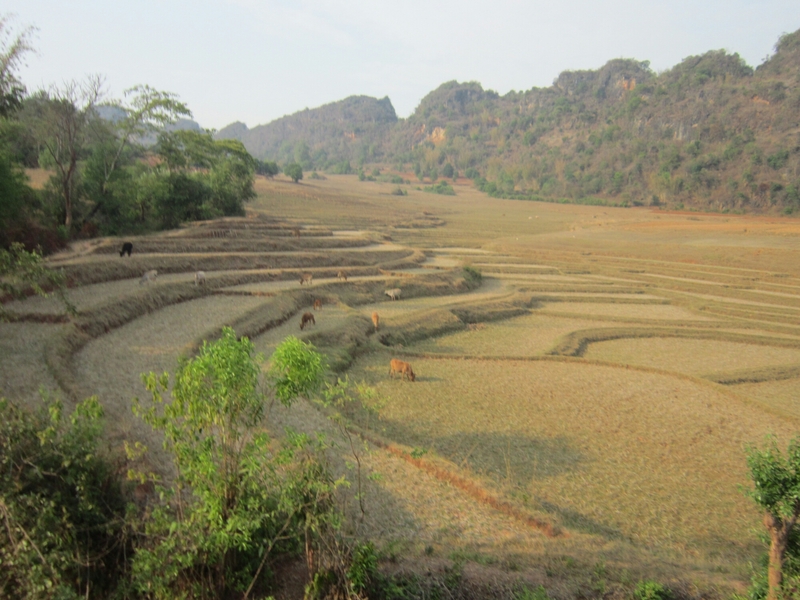 We spent the night in the village of Pat tu Bauk. We stayed at the Mayors House which was pretty cool. 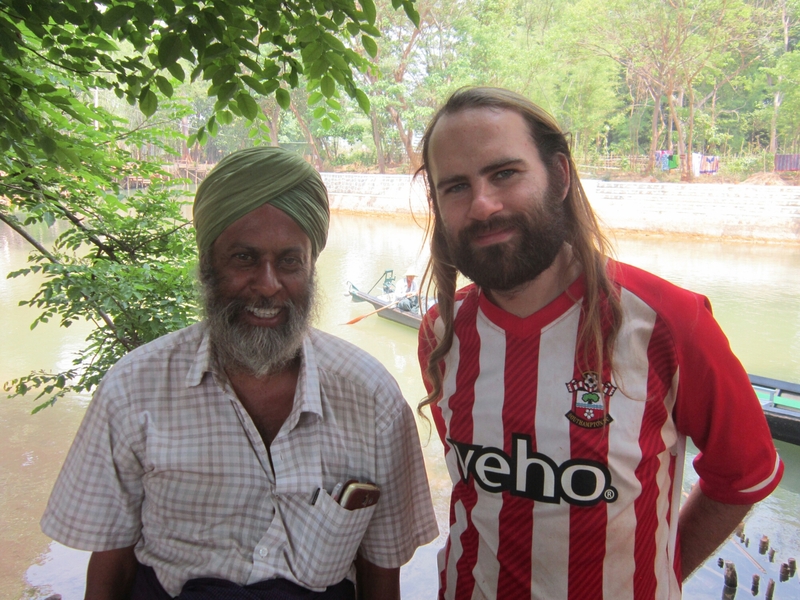 We met our Chef Yatoo and some of the locals. Our room had a long line of beds in a row which was ok. Again, shower was cold water and a bucket. Next day was the last. It was also the toughest as the heat got very intense. First off we passed by a monastery and a village where one of the girls bought a headscarf from the locals. We passed through the highest point on our trek. After this we came to the ‘Inle Zone’ which you have to pay a fee to enter. I thought alot of the landscape we passed through was awesome. At one point we met a couple returning from visiting family on pilgrimage. They were amazed to meet us and asked for photos which we obliged. They also gifted us some sliced apple, very kind of them and testament to now nice the people in Myanmar can be sometimes. After this we proceeded in the very hot weather and soon could see the lake! We headed downhill towards it before finally arriving at the south by one of the rivers that offshoot from the lake. I was exhausted! We had food there (Yatoo cooked for us again!) and said our farewells to Mr Robin. He had been a fantastic guide! Really nice guy. From here we took a boat up through the lake to reach Nyaungshwe, where people generally stay to visit the lake. Our trek was complete, it was fun but very tiring! Next post i’ll talk about exploring the lake itself!